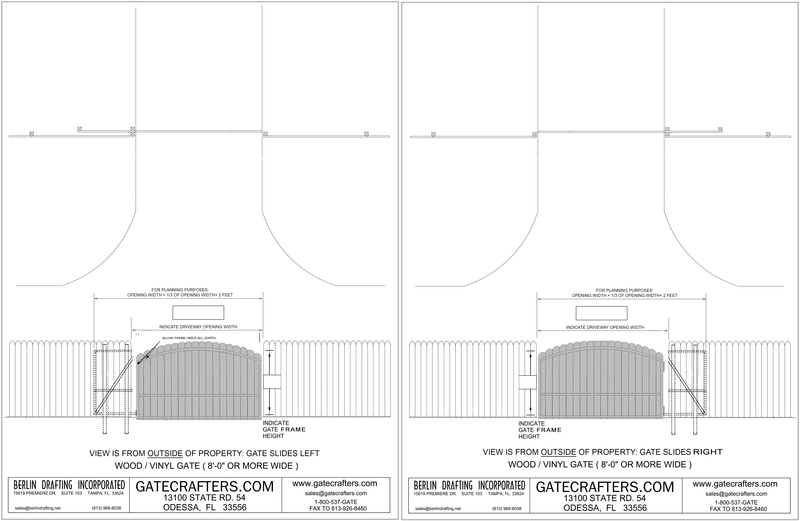 GateCrafters.com has created an easy DIY multi-sized arched vinyl/wood slat gate frame kit for sliding gates. Use the Gate Crafters Vinyl/Wood Single Gate Frame Kit to build a vinyl or wood single gate to replace an existing gate, make your gate easy to automate or match a desired look. Wood / Vinyl gates that slide are not an easy thing to build on your own. Kits in the major hardware stores are virtually non-existent. And even if you do happen to find the supplies to build one for yourself you are going to end up with a V groove rolling gate; which is horrible for automation because of the resistance rolling on the ground adds. 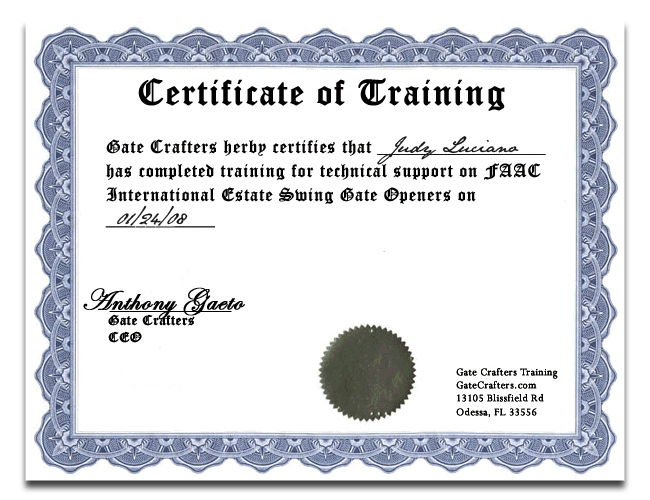 GateCrafters.com builds custom sliding gate frames WITH our safe and automation friendly cantilever sliding gate design. With our cantilever slide gate frame there are no wheels on the ground. The gate is suspended from the ground by the trolleys on the two posts we provide. The gate glides (note we didn't say slides, it is far too smooth and fluid of an action to be described as sliding) on these trolleys and is kept in line by the roller guides on the top of the post. This system is a much safer since there are no wheels on the ground possibly running over toes and the channel the trolley is in is designed in such a way that it cannot pinch fingers if they are inserted. Sizes: You can do any size you need under 12' in length. You can specify the width in exact inches, simply round up to the next footage option for pricing. Automation: Automate your sliding gate frame after you install it; our gate frames are made to be automation friendly. The Estate Swing ESL450 and ESL1800 are great gate openers for those with power close by. If solar is a must for your installation Apollo/NICE makes the most solar friendly gate openers available. Non-Automation Locks: We have a number of options for locking your sliding gate if you don't plan on automating it or if you plan on automating it in the future. If you never plan on automating the gate consider utilizing a drop rod or manual latch to hold the gate in position. If you are automating in the future our pedestrian gate lock kit can be utilized to lock the gate tail to the posts when the gate is closed. 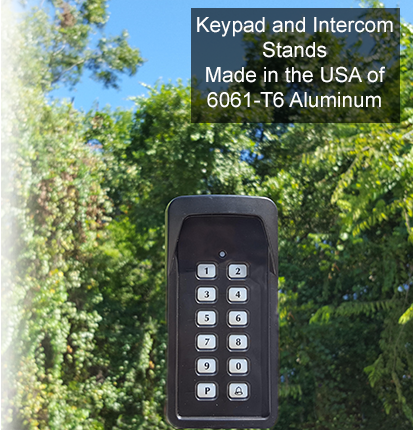 The pedestrian gate lock kit is a electronically released lock through keypad, intercom or push button. 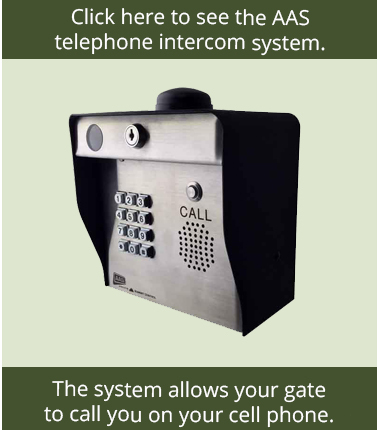 If in the future when you automate everything included in the pedestrian gate lock system will be able to be utilized in conjunction with the gate opener. Use this gate sliding frame kit by attaching the vinyl or wood slats (vinyl/wood slats not included) to the 2" x 2" aluminum frame and aluminum intermediate frame stiffener, and for vinyl/wood gates longer than 8' will include a 1/4" x 3/4" flat bar diagonal bracing welded on to the framing for extra stability. To use - attach the vinyl/wood slats (slats not included) to the 2" x 2" aluminum frame and aluminum intermediate frame stiffener. It attaches on one side to allow a multitude of vinyl or wood sizes and styles. Every gate is shipped with a can of self etching primer as a base coat for the frame and then can be painted any color needed. GateCrafters.com uses Marhide self-etching primer by Bondo. A self-etching primer is an essential undercoat layer of paint over aluminum. Primer kills stains, retards moisture and provides a good surface for a topcoat of paint to adhere to. It is imperative that new or bare metal and aluminum is primed prior to painting. Bondo is the producer of the top bare aluminum primers on the market. 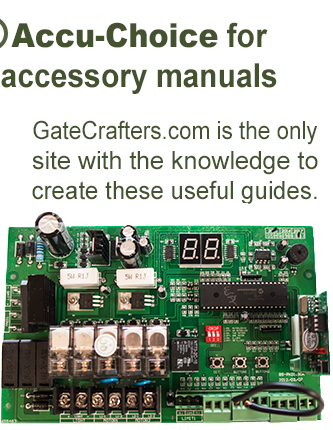 There are two easy steps to ordering your gate frame kit. 1. Download the order form and indicate the measurements. Sign the order form indicating you have approved the measurements. 2. Add the kit to your shopping cart along with any posts, automation equipment or other accessories you may like and checkout through our SSL Verisign secured website. We will then contact you via e-mail to let you know everything has been received and an approximate ship date.